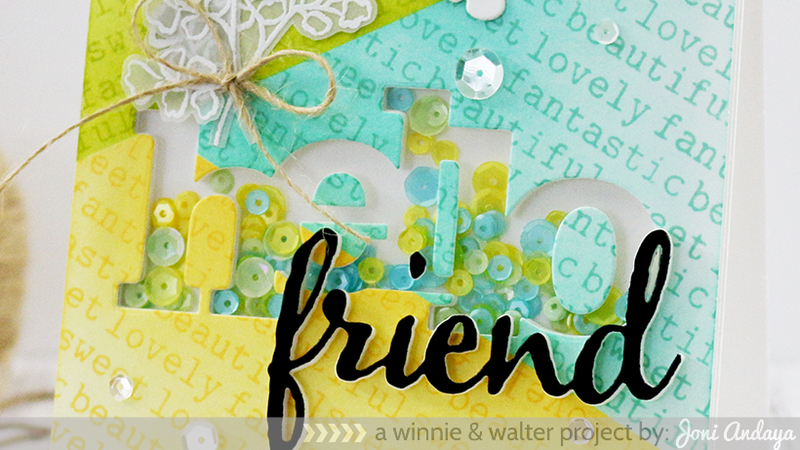 Hello Everyone, Welcome to the Day 1 Winnie & Walter Release Previews. Winnie & Walter is showcasing the new The Big, the Bold and Comfort, The Big, the Bold and Friends, The Big, the Bold and Comfort cutaways, and The Big, the Bold and Friends cutaways. For today I am showcasing the The Big, the Bold and Friends, The Big, the Bold and Friends cutaways, In a Word: Hello cutaways, Essentials: Audrey cutaways, In Bloom: Addie's Garden, and In Bloom Lola's Bouquet. To begin my card I first mask the top panel using post-it and then distress the panel using Ranger Distress Ink pads. After distressing I then stamped the sentiments from The Big, the Bold and Friends stamp set for having that font background I am going for. Next, I die-cut the panel with the new In a Word: Hello cutaway to create a shaker. This large font die are so fun to use, really awesome to use for any type shaker projects you might have. Once the shaker was put together, I add the new pretty die-cut word "friend" from the The Big, the Bold and Friends cutaways using black cardstock for a pop of color. The sequins I used inside the shaker are from Pretty Pink Posh in Lime Sorbet, Aquamarine, and Lemon Drop in 4mm & 6mm. Outside the shaker also from PPP in Sparkling Clear in 4mm, 6mm, and 8mm. For added touch I white embossed the leaves image from the new upcoming In Bloom: Addie's Garden and added a natural twine. I also added a butterfly die-cut from the new Essentials: Audrey cutaways to finish off the card. For my next project I created a birthday card using the new In Bloom: Lola's Bouquet stamp set that I Illustrated for Winnie & Walter. This set will be preview tomorrow, don't forget to come back here tomorrow to enter my Giveaway for the new In Bloom: Lola's Bouquet. To begin my card I first mask the white cardstock panel with post-it and distress it with yellow ink, then added some white dots using the Uni-ball white pen in broad tip. Next I stamped the vase and roses images from the set, then fussy cut. The vase was colored with Copic maker. I then adhered all the pieces together on the card panel. I also added some grey Copic coloring on the bottom panel, this helps ground the vase on the card to make it not to look that its floating on the panel. The sentiments were from the Winter Woodland stamp set. 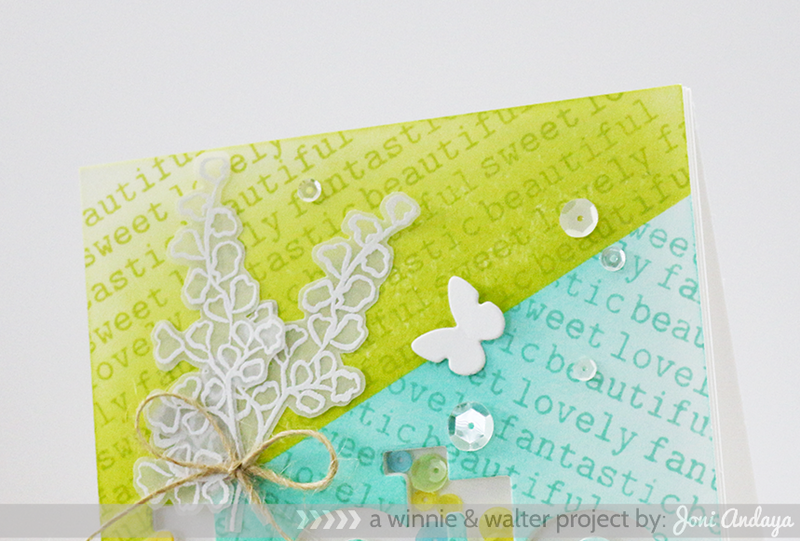 I also added some Lemon Drop and Sparkling Clear sequins from PPP to finish off the card. For more inspiration please visit Winnie & Walter. Hi Joni! Stunning cards as always♥ You did a great job! These are gorgeous! LOVING the colors and the flowers on the second one!!!!!!!!!!!!!!!!!!! Gorgeous cards Joni! I love them both, so creative and beautiful!!!! Pretty cards!! 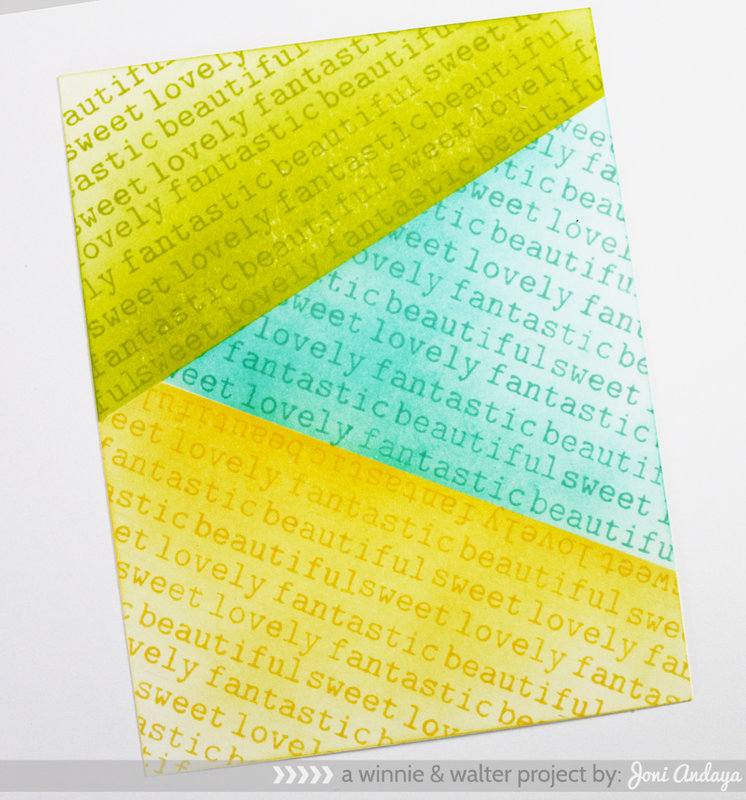 Love the ideas for use of color and design! Absolutely beautiful card with pretty colors ! These are both gorgeous!! LOVE that you created a shaker from the word cut!! Gah! You blow me away! Love all the attention to detail and techniques packed into your first card. And that full bouquet of flowers is just so smile-inducing!! Love how you did the masking on both cards. So pretty! So beautiful!!! so detailed :))) bravo! Oh, I love your shaker card!! Such vibrant colors! Beautiful design! Makes me smile instantly! WOW, beautiful cards, Joni! Love the background of the shaker card, and the vase of flowers on the 2nd card, gorgeous! Seriously ADORABLE, Joni! I love these. Your colour choices are awesome as well! Beautiful cards...love the use of inking and masking. Amazing cards Joni! Can't wait for W&W release! LOVE these cards! 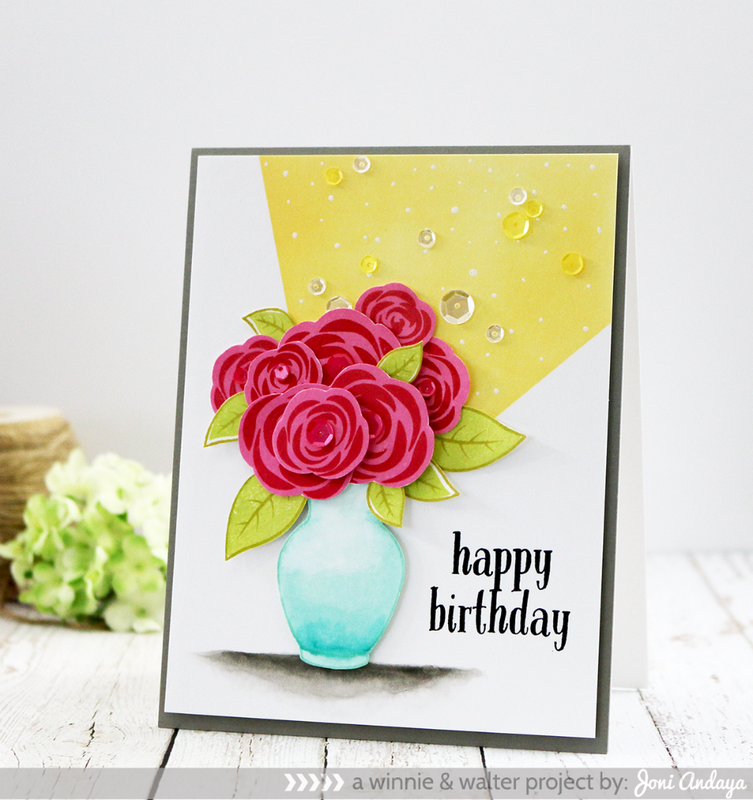 The background on the first card is soo awesome and those flowers in the vase are stunning! Wow! These are stunning and absolutely love them both! Also, gorgeous stamp set you designed. Beeeee-oooootiful!! Gorgeous designs, Joni! And divine masking techniques!! Oh so beautiful and such a creative background ! I love the flowers and your backgrounds! Fabulous cards with gorgeous colors and details! 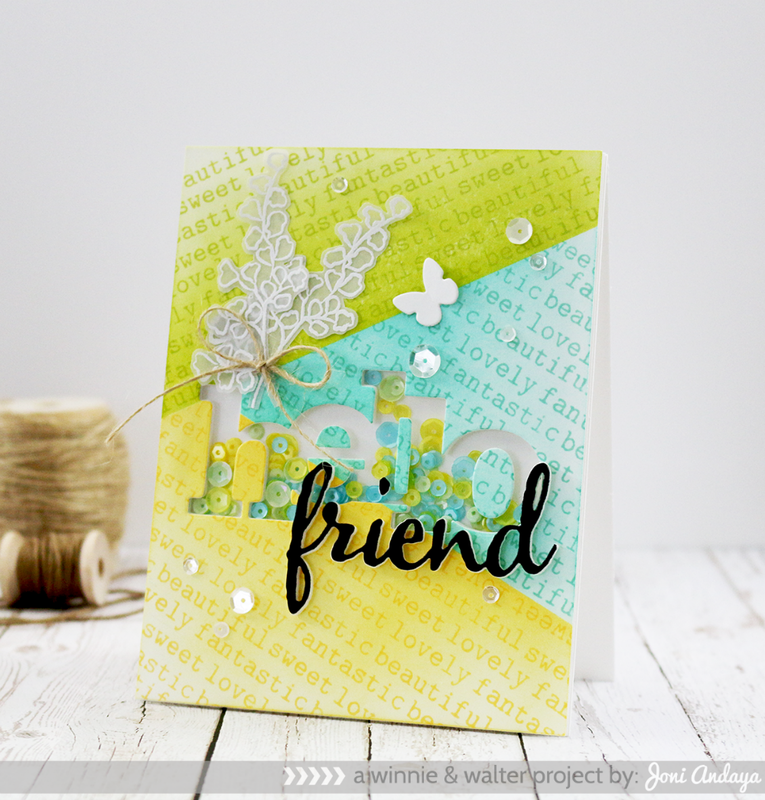 I love the In Bloom stamp set as well as your beautiful cards! Lovely Joni! Beautiful sponging and stamping with the sentiments as background and so very nicely dressed with the vellum sprig, cut out and shaker ingredients! Your second card is equally as pretty with the beautiful blooms. I can't wait to get the new set that you illustrated. Congratulations! Loving already the friend die, so clever. The blooms are esquisite. Thanks for sharing. 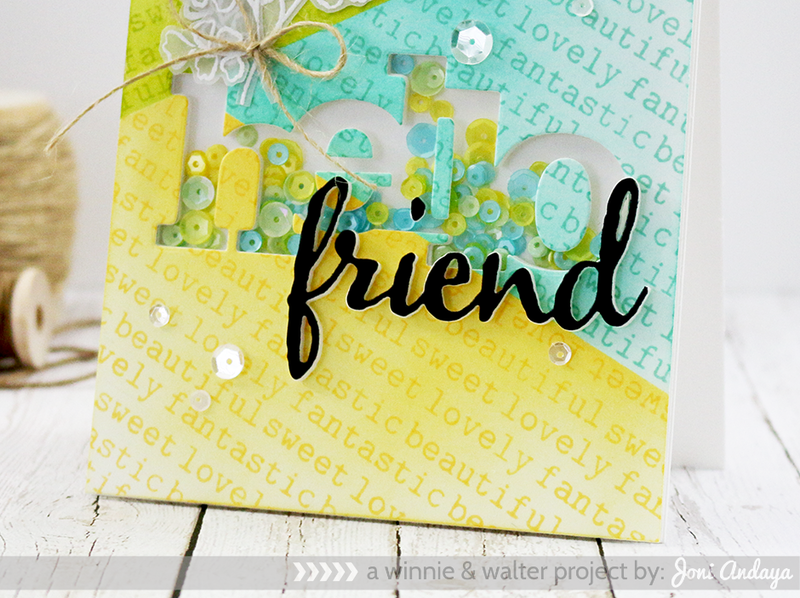 Joni I love your stunning hello friend card. Gorgeous colour and amazing design.